In a roughage diet, 65% of VFA is acetate. Cattle on high concentrate diets produce more propionate; the propionate provides more energy to the cattle, which is part of the reason cattle on concentrate grow faster. It is hard to culture bacteria that live in the rumen. However, we can extract DNA and RNA from a sample from the digestive system. We can then sequence this DNA. When we do this, we realize that we can only culture 5% of the microbes that live in the rumen. In every milliliter of rumen fluid there are 10 billion to 100 billion bacterial cells. There are also anaerobic fungi, ciliate protozoa, and methanogenic archaea. Protozoa are predators. They eat other microbes in the rumen. The number and diversity of protozoa are higher in a forage diet. 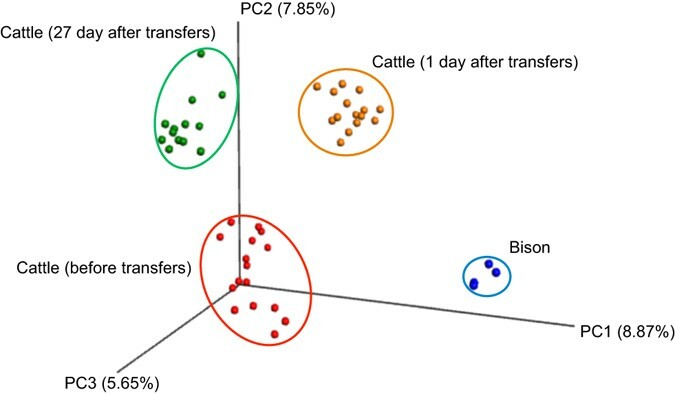 From an energetic perspective, the protozoa eating bacteria are robbing from the cattle. Fungi have the most complex life cycle of microbes in the rumen. One stage swim around and find a place to latch onto. They then produce root-like structure that borrow into plant fibers. This is like the roots of a tree breaking up concrete. The bacteria can't do this, so the fungi create more surfaces for the bacteria to attached to. Microbia get into the rumen through maternal transfer, feces, feed transfer, housing, water, and products. The colonization takes 2 to 20 days after birth. Ther first are aerobic microbes. They help create an anaerobic environment. The final microbes to be established are the predators. From the 1st, to 2nd, to 3rd weeks after birth the rumen microbiome becomes more complex. As the community of microbes becomes more diverse, the types of digestive functions that they can complete increase. Once the rumen of an animal evolves to digest a diet (say roughage), those microbes remain in the rumen at low levels for the rest of the animals life. This means an animal can switch from a forage diet to a concentrate diet and back to a forage diet because the microbes needed to digest that diet are still in the rumen. The rate of carbohydrate digestion depends on how complex the carbohydrate is. Simple sugars are digested rapidly. Cellulose (fiber) takes as long as 24 hours. There are primary and secondary colonizers. They work together to create a bio-film around plant particles. Microbes hate fats. They also cannot digest lignins in the anaerobic environment of the rumen. Seeds are coated in lipids and lignins, which is why we process grains before feeding to cattle. There are differences in how well animals chew their feed. An animal that chews their feed more will allow the microbes to more efficiently digest the feed. Ammonia fiber expansion (AFEX) is a chemical treatment of low quality feed. This allows wheat straw to be as high quality of a feed as alfalfa. The number one determinant of the microbes in the rumen is the type of feed being feed. Animals like deer that are browsers that eat a variety of food have a more diverse rumen microbial community. If we transfer the rumen content of bison into canulated cattle, what happens? They replaced 70% of the cattle rumen contents with bison rumen contents. After 27 days, the cattle rumens evolved to be more like the original cattle rumens, but they were also different now. What strategies reduce methane emissions? One feed yard was losing $10,000 worth of nutrients because they were not processing their feed enough and there was undigested starch in grain kernels in the feces.